Stand straight and proud facing the middle of the room with your shoulders parallel to the wall behind you. Raise a fist to the center of the ceiling; this will be the apex of the pyramid. Feel the energy of the other people in the room. Feel the energy of the earth coming up through your feet. Feel the air around your body; it is also full of energy. Feel the energy of your own mind. Feel the energy of your voice like a shout inside of you, but don’t open your mouth. Channel all of this energy through your body and out your fist. 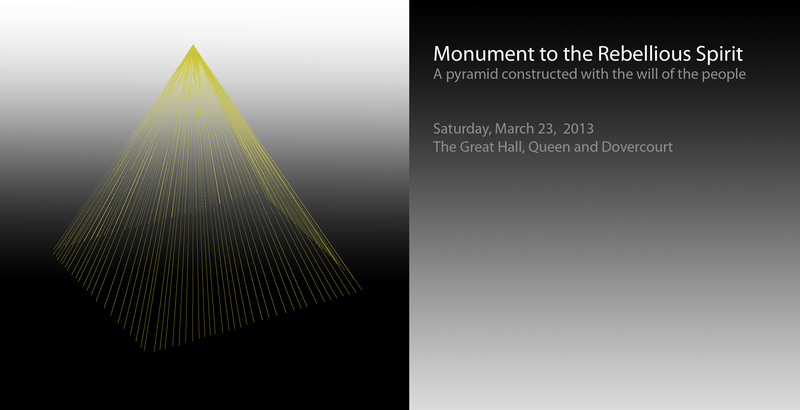 Visualize a golden beam running through your body to the apex of the pyramid. Concentrate on this energy as long as you can, attempt to make the it tangible with the power of your intention. If your arm gets tired, switch to the other arm, if your mind gets tired think about a world without greed and refocus your energy on the pyramid.